Vapor King is certainly one of the more prominent e-cig companies on the market today and they offer a wealth of starter kits for those who have enjoyed their product. There are six starter kits for their product which is somewhat above the average number for most e-cig companies. However, there are significant differences between the kits which makes them a good value for those who enjoy e-cigs as well as fitting into their budgets. Offering both traditional electronic cigarette models and the Storm models which are more of the likes of eGo cigarettes, with larger batteries and custom tanks. Vapor King pleases more than one crowd. With re-fill tanks on all models, those who prefer e-liquid bottles will also be pleased. Read our Vapor King review for more information. The Express is the perfect entry-level starting kit as it provides just enough to get started at a minimum price. The long-lasting battery and five pack of cartridges makes this the perfect pick for those who have yet to try Vapor King. The standard rechargeable lithium battery comes in any color, both in automatic or manual mode. Vapor King’s standard batteries and atomizers produce almost as much vapor as the Storm models, but simply have less battery life and need to be charged more often. The atomizer and eTank cartridges are both new additions to the Vapor King family. The new eTank technology has no cotton or material to act as a wick. 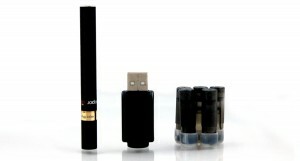 Instead it holds only e-liquid removing the bad taste that often comes near the end of cartridges. Limited to 16mg nicotine strenght tobacco and menthol pre-filled cartridges or pick the empty cartridges with a raspberry 15ml e-liquid bottle. The Vapor King eTank Deluxe Kit is a big step up from the Express Kit. The kit includes 2 batteries and two high intensity atomizers which produce sweet vapor. A wall adapter for quick charging is included. This time you have the choice of nicotine strength on the tobacco and menthol cartridges or pick empty ‘Clearomizer’ cartridges for refills and get your choice of many of their great e-liquid flavors instead. For those who prefer a traditional cigarette look-alike smokeless e-cig, this may be your pick with Vapor King. This Vapor King eTank Ultimate Kit surely holds its’ name well. With more than enough to ensure your vaping pleasure for a long time before you need a refill, it also allows you to try a range of flavors with 3 E-Liquid bottles and 5 packs of flavor cartridges. You get an additional car charger along with the USB and wall adapter. A DuPro luxury case that fits 2 batteries, 1 atomizer and 2 flavor cartridges as well as a pocket pouch for easy carrying. So overall, it has all the chargers, plenty of cartridges and refills, as well as transport accessories at a very affordable and competitive price. Above Vapor King’s traditional electronic cigarettes, rests a great device on the throne; The Vapor King Storm eGo electronic cigarette. The Storm has a 650mAh lithium battery that will outlast all traditional e-cigs. Being larger it can hold up for a full day of vaping. The bigger tanks,which are called ‘Clearomizers’, replace the traditional cartridges and atomizers and come in different sizes and colors. The atomizer is more economical by having to replace only part of it. They don’t produce an overwhelming amount of vapor, although more than the standard model, they are not overpowering. Both of the Vapor King models have think satisfactory vapor, and the point of this device is mostly longer life and cheaper refills. Available in black or stainless, you can also upgrade to a 1100mAh battery or include an LCD screen for just a few dollars. This entry level Vapor King Express Kit introduces you to Storm Clearomizer Electronic Cigarettes and is sure to leave you pleased with the performance. 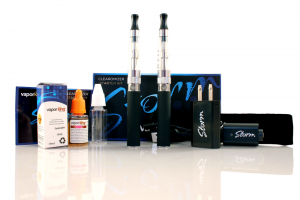 The Vapor King Storm Deluxe Starter Kit is ultimately the same as the Express Kit but doubles batteries and clearomizers. With two of each, it would be enough to share with a friend or family member, but unfortunately, it still just includes 1 e-liquid bottle 1 USB and 1 Wall charger. You can upgrade one or both batteries to 1100mAh and pick any flavor and nicotine volume for the e-liquid bottle. The value of the kit is still great, considering the cost of most eGo batteries and tanks available on the market today. The Ultimate Starter Kit includes 2 regular Storm batteries and one high powered battery with 3 clearomizer tanks and 3 coil replacements. Hardware should be enough to cover even the biggest Vapor King fans. The kit also inclused all 3 chargers, 3 bottles of e-liquid a carrying case, carrying pouch and even a lanyard. For those looking for the cream of the crop package from Vapor King, this is it. 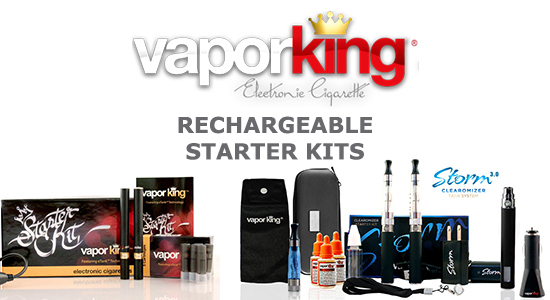 Overall, Vapor King offers a great selection of starter kits that ensures everyone will find one that suits their tastes and budget. A high quality product at a great value, Vapor King is truly a winner. © All rights reserved 2016 - Everything You Need To Know About E-Cigarettes.